Every summer, gardens at home are hit or miss on what grows and what doesn't. Sometimes a plant just grows and grows! This was the case for the gardener who brought me multiple bunches of hot peppers – jalapeños, poblanos, and lots of small red hot peppers. Just for fun, I decided to string and hang the red peppers to dry. For instructions on drying peppers on string, I recommend reading Heat up summer with peppers (University of Missouri Extension) and Using Chile to Make Ristras and Chile Sauce (New Mexico State University Cooperative Extension Service). I air-dried these peppers indoors, which took a little more than a month. If you want to dry the peppers faster, look to a dehydrator for help. Once dry, I thought I could make cayenne pepper with the dried skins, but what my experiment became was red pepper flakes. And, boy, are they HOT and SPICY! Download this infographic for instructions on what I did. 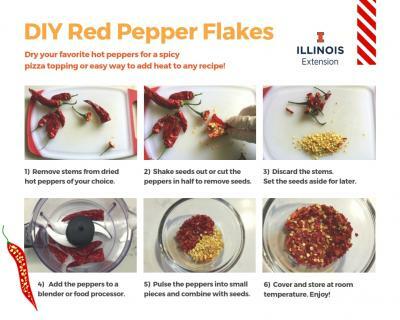 Besides sprinkling on pizza, what recipes do you spice up with red pepper flakes? Tell us in the comments. And read my post on red pepper flakes on Healthy Eats and Repeat for a tasty recipe.